A standard, off the shelf solution compatible with Eldon's standard hole pattern, which simplifies procurement and installation. Cage nuts designed for universal use on the enclosure frame profiles and the profiles system. Cage nuts for fixing components and equipment to the enclosure's frame or profile system. A standard off the shelf solution compatible with Eldon's standard hole pattern within enclosures and accessories. 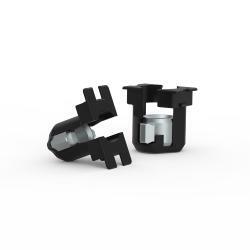 The cage nuts can be used to fix accessories and components, simplifying the procurement and ensuring that components can be installed easily.